Now that you are aware that the vanity will be something that a guest will remember when they visit, you will need to put in an amazing unit that will coordinate with the chosen theme of the bathroom. At first this may seem like a daunting task but in the end if you have faith in yourself you should have no problem making a great matching combination of vanity and mirror. 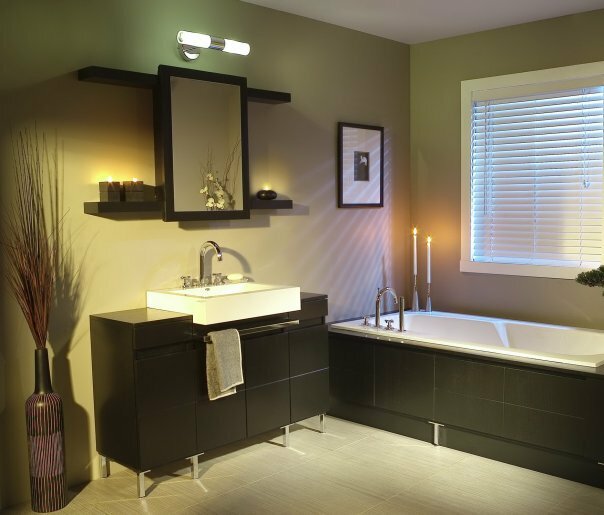 You can always choose a more natural touch in the restroom by going with a wood style bathroom vanity. The way to keep the same theme all throughout the entire bathroom is by adding great accessories that are constructed from wood. An example here is towel racks, framing on the mirror, or a toilet paper holder. If used correctly it can bring the entire theme together. If you ever get tired of the wood style you can always paint over the stain. You can even add silver or gold accents around or on the vanity such as drawer knobs or handles. Gold goes well with the warmer tones while silver goes with the colder tones like blue. It is relatively easy to add hues of reds and greens or even tans. They can be displayed by using towels or washcloths. It is very common to find a vanity with silver or gold accents. Combine the vanity to a tub of the same collection to create a perfectly harmonious bathroom. If you’re looking for a way to antique your new bathroom with fixtures and pipes you can choose a custom vanity that has cast iron plumbing associated with it. If you are searching for a new and different setting for your bathroom, add a few personalized touches to it like a claw foot tub or older style wash basin. Then the next biggest thing you will need to be concerned with is the style of a new bathroom vanity mirror that you are going to choose. When you are working with a total custom design you should start by going online and looking for that one of a kind piece of amazing furniture that will set the tone for the whole bathroom. You might even find a custom shaped mirror.